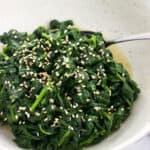 Garlic sesame spinach is such an easy side dish! Spinach is quickly sauteed with garlic, and tossed with sesame oil for a boldly flavored and healthy recipe. This pairs so well with salmon, chicken, and more. Most of the time my main dish game is on point. 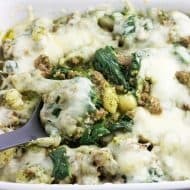 I say most because there’s at least one day a week I stand in the kitchen at dinner time with no idea what to make, and another one (or two) I root around the freezer to see what leftovers we have on deck. But do you know what is decidedly not on point? My side dish game. I’m all about a side dish on a specialish occasion, but I most of the time I fall back on a side salad for our dinner accoutrement. Not that there’s anything wrong with a side salad. You can easily mix up your dressings and veggies/fruits/nuts to complement your dinner cuisine. 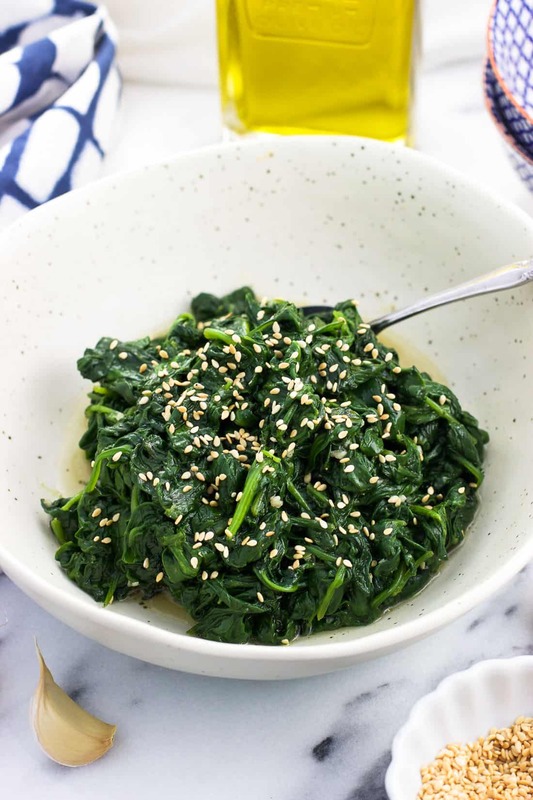 This sauteed garlic sesame spinach fits the bill on being an easy (read: quick!) 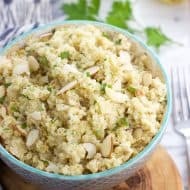 and nutrient-packed side dish recipe. Start to finish it takes between ten and fifteen minutes, and uses nearly all kitchen staples that you have on hand. Only thing you might need to get is fresh spinach. 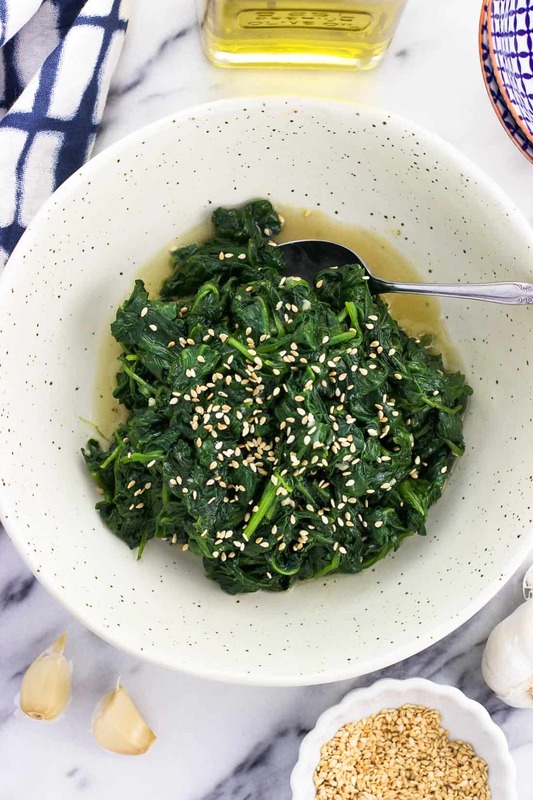 This sesame spinach recipe starts out very similarly to a lot of my savory recipes: by sautéing garlic in olive oil. After a minute or so you’ll add as much spinach as can fit in your pan, then season it with salt and pepper. Spinach wilts quickly, so before too long space will free up in your pan. Add in the additional spinach, giving everything a stir or two, until all of the spinach has made it into the pan. At this point place a lid on the pan and cook for an extra few minutes, or until all of the spinach is wilted to your liking. Now! 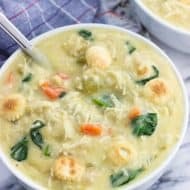 Here’s an important step in this simple recipe. 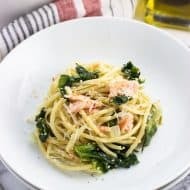 Since spinach releases a fair amount of liquid while it cooks, you’ll want to lift the sauteed spinach out of the pan into your serving bowl before proceeding to the next step of the recipe. Take care to leave as much excess liquid behind as you can. All that’s left to do is to toss the spinach with sesame oil, so excess water would dilute all that delicious and bold flavor. 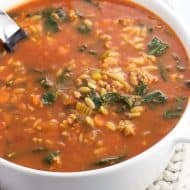 It’s inevitable that some liquid will remain so don’t make yourself crazy, but transferring the spinach from the pan to a bowl using tongs or a slotted spoon will help mitigate. 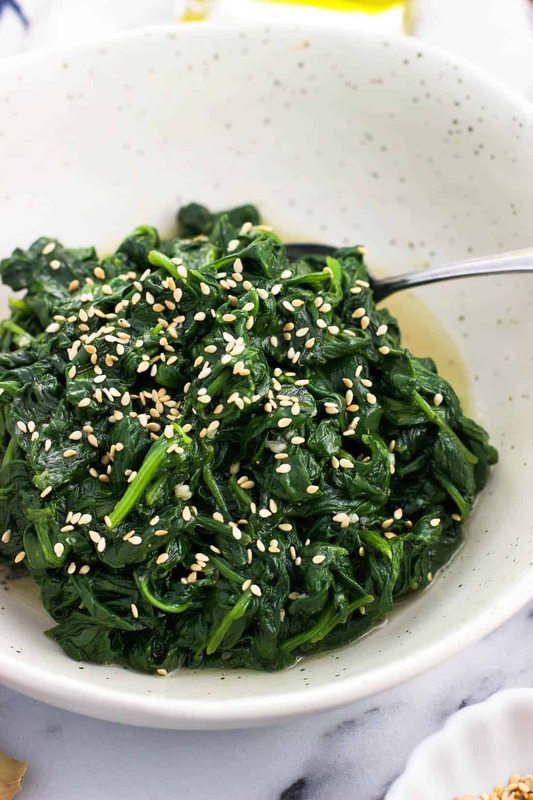 I love garnishing this sesame spinach with toasted sesame seeds to keep the sesame flavor going. 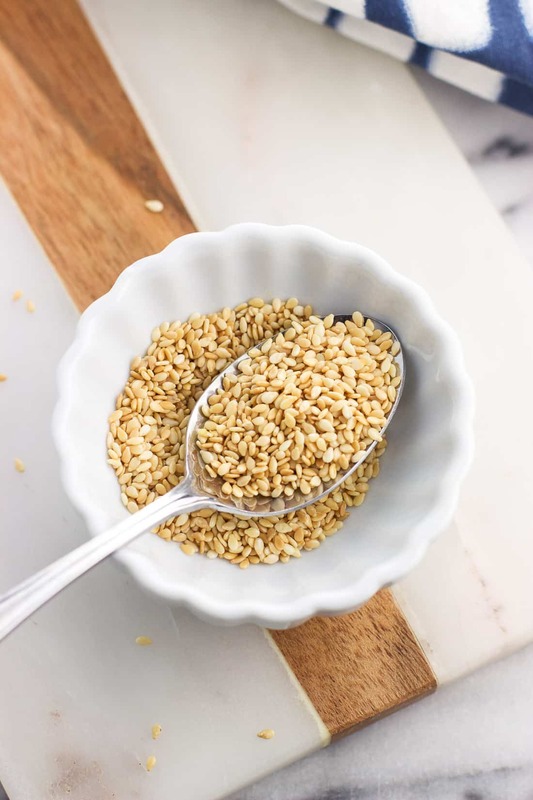 Toasting transforms kind of ho-hum, plain sesame seeds into a garnish with a deeper, roasty flavor. Giving them a quick toast is a total game-changer in my opinion! Add untoasted sesame seeds to a dry (ungreased) skillet set over medium heat. Toast them for 5-6 minutes, shaking up the pan frequently to prevent the bottom sides from burning. Once they’re golden brown, transfer them to a plate right away so they don’t continue toasting. That’s it! 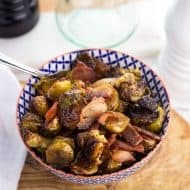 You can also place them on a rimmed baking sheet in a 350°F oven for 8-10 minutes, or until just becoming fragrant and have browned. With either method you use, keep a close eye on them as they can go from perfectly toasted to burnt in no time. Be sure to drain the excess liquid from the spinach before tossing with sesame oil, otherwise it will dilute the flavor. I transfer the spinach from the pan to a bowl using either tongs or a slotted spoon. Add olive oil to a large pan set over medium heat. Add minced garlic and saute for 1-2 minutes. Add as much spinach as can fit in the pan and season with salt and pepper. Stir the spinach around the pan as it wilts, and add additional spinach as space opens up until all is added. Once all of the spinach is in the pan, place the lid on the pan and cook for an additional few minutes or until the spinach is wilted. 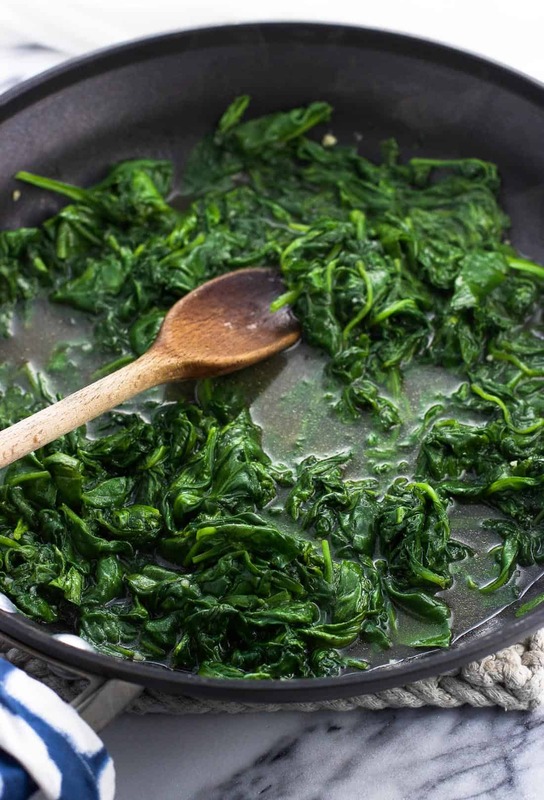 Transfer the sauteed spinach to serving bowl using tongs, taking care to leave behind as much water as possible. Drizzle sesame oil over top of spinach and toss to combine. Sprinkle toasted sesame seeds over top for serving.